I'm happy to report that the fifth and final bridesmaid dress is done! This one was for Hannah, one of my oldest friends, who always looks classy and stylish. ...and this vintage one, Simplicity 6899. It had the basic element of the pointed midriff panel, but I had to reshape it a little. You can see how I made some modifications to all three patterns to make it the shape I wanted! I see now why I saved this one for last, I guess! It was the most complicate to cut out but luckily everything went together well and it fits her great. You can see the other bridesmaids' dresses here, here, here, and here. This one's definitely my favorite! I love how it came out. Beautiful! 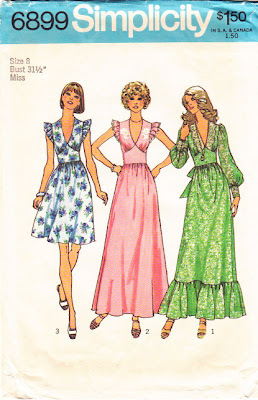 i have loved seeing all the bridesmaid dresses you have made. they have all turned out beautifully! and such a lovely, thoughtful thing to do for your bridesmaids. This one may be my favorite, because I'm so fond of pointy midriffs, but I really admire all the work you put in those dresses. I hope you'll have group pictures _ these five pleated dresses should look super good together! i would totally wear this, it's sper flattering and beautiful! I first thought: "Too cute!" and then saw her awesome tattoo and thought "BADASS." So yep - both of those things. Nicely done! What a beautiful dress and in my opinion, so much nicer and more chic looking than the inspiration dress. What a great looking dress! You are going to have a very lovely looking bridal party! I've been following along since the first bridesmaids dress and all of them have turned out so well! Aaaw, thanks so much, everyone!! Hannah is pretty badass, but also soooo pretty! I am really excited to see all the bridesmaids together, too! Even better than the inspiration dress! Much nicer details, and a great fit. By far my favorite one!!! They all came out beautifully! Great job!! !